The global lidding films market is witnessing solid growth over the past few decades. The changing lifestyle along with changing domestic structure in urban areas in these economies is increasingly leading to switch to organized retail channels such as supermarkets and hypermarkets for everyday needs. This is positively impacting the lidding films market for packaging needs of food service companies. The rise in budget of food service companies for branding and promotional campaigns of newly launched products is paving way for the growth of lidding films market. Several food and beverage brands prefer lidding films for promotion to enhance brand visibility. 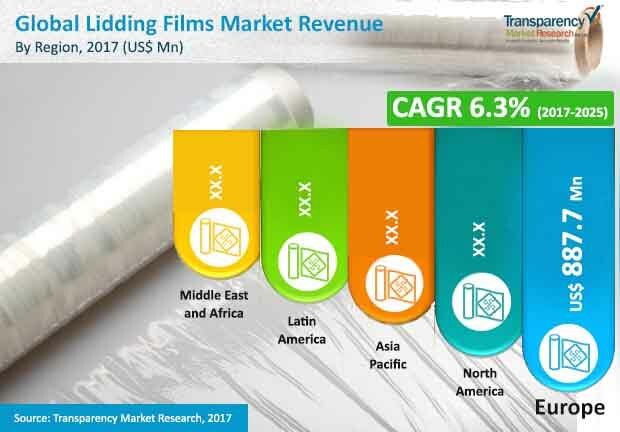 A report by Transparency Market Research (TMR) estimates the global lidding films market to become worth over US$5 bn by the end of 2025 increasing from US$2.9 bn in 2016 at a CAGR of 6.3% for the forecast period between 2017 and 2025. The global lidding films market is segmented on the basis of material type, product type, application, end use, and region. The global market by product type has been segmented into dual ovenable, specialty, high barrier, breathable and die-cut lidding films. Among the key product types, the high barrier lidding films segment is anticipated to hold 53.6% of the market in 2017; going forward, the segment is anticipated to lead over the forecast period. On the other hand, the dual ovenable lidding films segment is projected to display a significant 7.4% CAGR vis-à-vis revenue over the forecast period. The global lidding films market has been divided on the basis of material type into PP, PE, PVC, polyamide, EVOH, aluminum, and others. Globally, among the key segments, the polypropylene segment is estimate to dominate the market in 2017 holding 20.2% market share. On the other hand, the PET segment is anticipated to exhibit hold 12.5% market share in 2017; the segment is anticipated to display an increased market share holding 13.1% of the market over the forecast period. Application-wise, the global lidding films market is segmented into cups, trays, cans & bottles, jars, and others. Of them, the trays segment is anticipated to lead the market over the forecast period. Lidding films find extensive application in cups and trays which together account for 60% share of the market. Going forward, trays and cups segment are anticipated to further gain in terms of market share by the end of 2025. The global lidding films market by end use industry has been segmented into food, pharmaceutical, personal care & cosmetics, and others. Among these, food segment is anticipated to account for the leading share over the forecast period. However, personal care & cosmetics end-use segment is anticipated to rise at an impressive 6.5% CAGR in the global lidding films market over the forecast period. In terms of region, the global lidding films is segmented into North America, Europe, Asia Pacific, the Middle East and Africa, and Latin America. In terms of value, Europe currently accounts for a significant 28.8% share in the overall market. The region is anticipated to register a CAGR of 5.6% over the forecast market, for the market’s valuation to become US$1,374.3 mn from US$887.7 mn in 2017. However, Asia Pacific is expected to surpass Europe lidding films market in terms of both value and volume over the forecast period. Leading players in the global lidding films market include Bemis Company Inc., Constantia Flexibles Group GmbH, Uflex Ltd., Amocor Limited, Berry Global Group Inc., Winpak Ltd., LINPAC Packaging Limited, Schur Flexibles Holding GmbH, Plastopil Hazorea Company Ltd, Flair Flexible Packaging Corporation, Multi-Plastics Inc., Golden Eagle Extrusions Inc., FFP Packaging Solutions Ltd., Impak Films Pty Ltd., Flexopack SA, and TCL Packaging Ltd. This report provides forecast and analysis of the lidding films market on global level. It provides actual data of 2016 along with estimated data of 2017, and forecast data up to 2025 in terms of revenue (US$ Mn) and volume (‘000 tons). The report also includes macroeconomic indicators along with an outlook on lidding films consumption pattern across the globe. It includes drivers and restraints of the global lidding films market and their impact on each region during the forecast period. The report also comprises the study of current issues with end users and opportunities for lidding films manufacturers. It also includes value chain analysis. In order to provide users of this report with comprehensive view of the market, we have included detailed competitiveness analysis and company players with their SWOT analysis and strategy overview. The dashboard provides detailed comparison of lidding films manufacturers on parameters such as operating margin, total revenue, product portfolio, and what we call ‘innovation scale’. The study encompasses market attractiveness analysis by product type, material type, application, and end use industry and by region. Market numbers have been estimated based on extensive secondary and primary research, average pricing of lidding films by product type and the revenue is derived through regional pricing trends. Market size and forecast for each segment have been provided in the context of global and regional markets. The lidding films market has been analyzed based on expected demand. Prices considered for the calculation of revenue are average regional prices obtained through primary quotes from numerous regional lidding films manufacturers, suppliers, and distributors. All key end users have been considered and potential applications have been estimated on the basis of secondary sources and feedback from primary respondents. Country demand patterns have been considered while estimating the market for various end users of lidding films in the different regions. Bottom-up approach has been used to estimate the lidding films market by regions. Global market numbers by product type, material type, application, and end use industry have been derived using the bottom-up approach, which is cumulative of each country’s demand. The same has also been validated from top-down approach. Company-level market share has been derived on the basis of revenues reported by key manufacturers. The market has been forecast based on constant currency rates. The report includes consumption of lidding films and the revenue generated from sales of lidding films across the globe and key countries. By product type, lidding films market is segmented into dual ovenable, specialty, high barrier, breathable and die-cut lidding films. By material type, lidding films market is segmented into polypropylene (PP), polyethylene terephthalate (PET), polyethylene (PE), polyvinyl Chloride (PVC), polyamide, ethyl vinyl alcohol (EVOH), aluminum and others. By application, lidding films market is segmented into cups, trays, cans & bottles, jars, and others. By end use industry lidding films market is segmented into food industry, pharmaceuticals, cosmetics & personal care, and others (chemicals & fertilizers, etc.). The report provides detailed competitive and company profiles of key participants operating in the Global market. Key Players of the lidding films market are Bemis Company, Inc., Constantia Flexibles Group GmbH, Uflex Ltd, Amcor Limited, Berry Global Group Inc., Winpak Ltd, LINPAC Packaging Limited, Schur Flexibles Holding GesmbH, Plastopil Hazorea Company Ltd, Flair Flexible Packaging Corporation, Multi-Plastics, Inc., Golden Eagle Extrusions Inc., FFP Packaging Solutions Ltd, Impak Films Pty. Ltd, Flexopack SA, TCL Packaging Ltd.